The gums are the mucosal tissue that lies over the mandible and maxilla. They are also called gingiva. They surround the teeth and provide a seal around them. Healthy gums are usually "coral pink." Other colors like red, white, and blue can mean there is a problem. 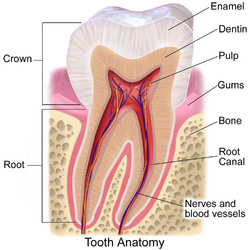 Red gums mean that the patient has gingivitis, or the inflammation of the gum. Healthy gums fill and fit each space between teeth. Healthy gums are firm and do not move very much. Healthy gums usually have no reaction to normal disturbance such as brushing. This page was last changed on 28 June 2018, at 14:04.